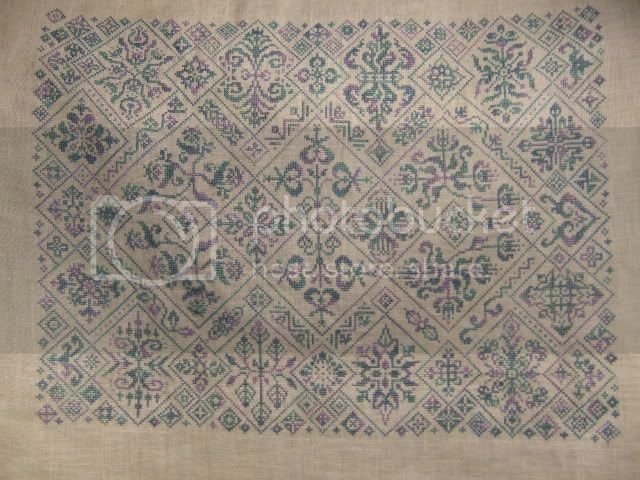 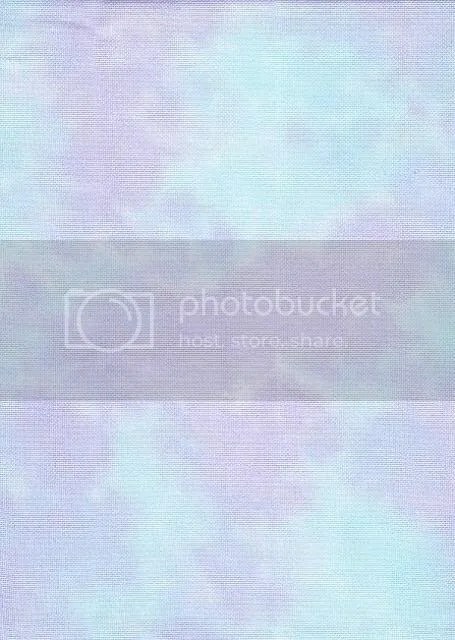 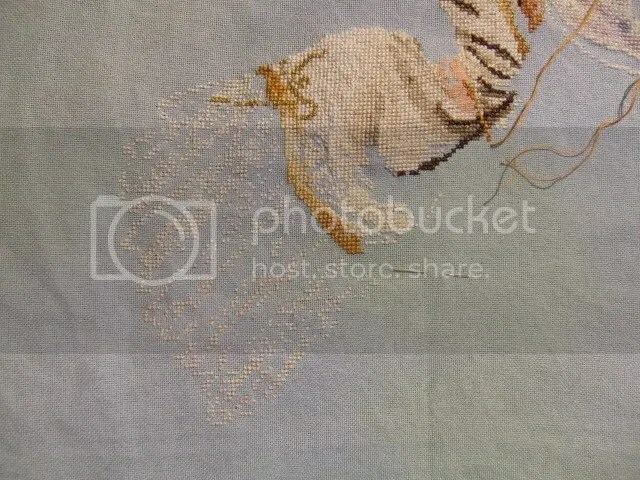 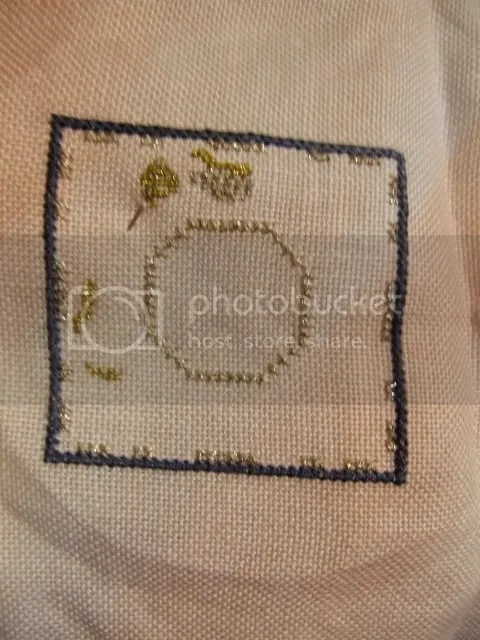 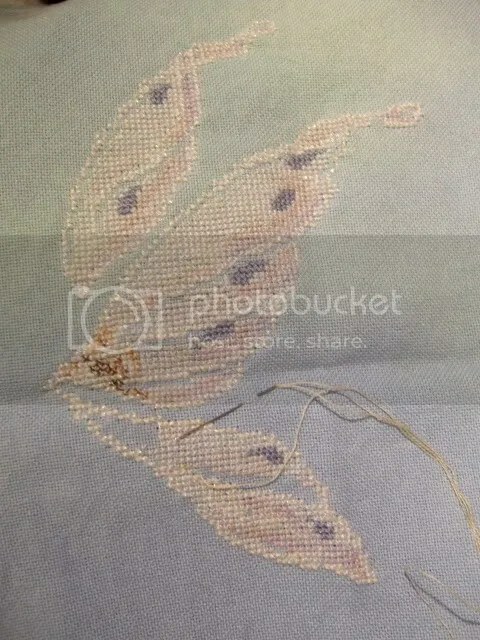 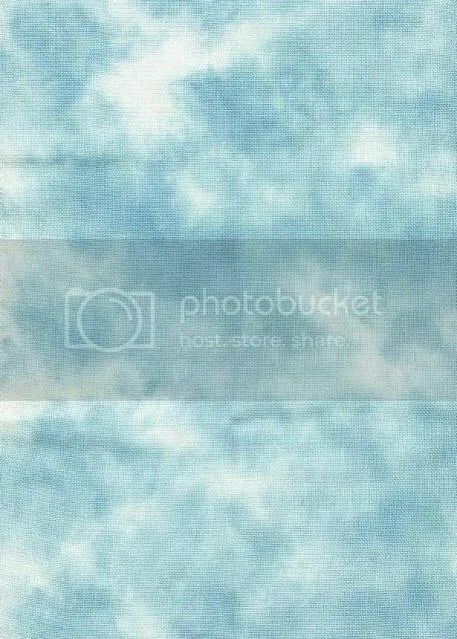 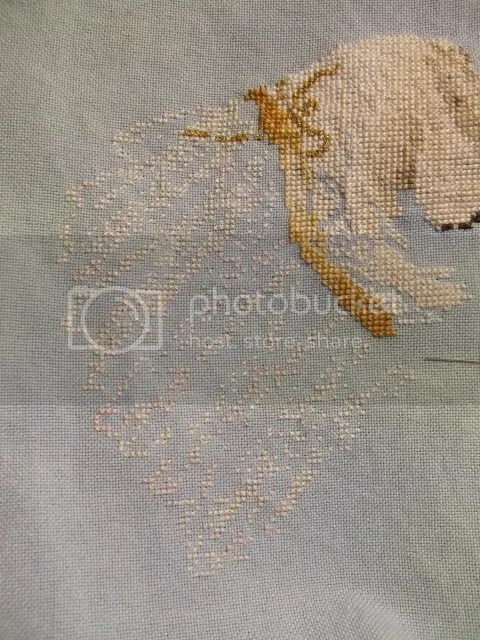 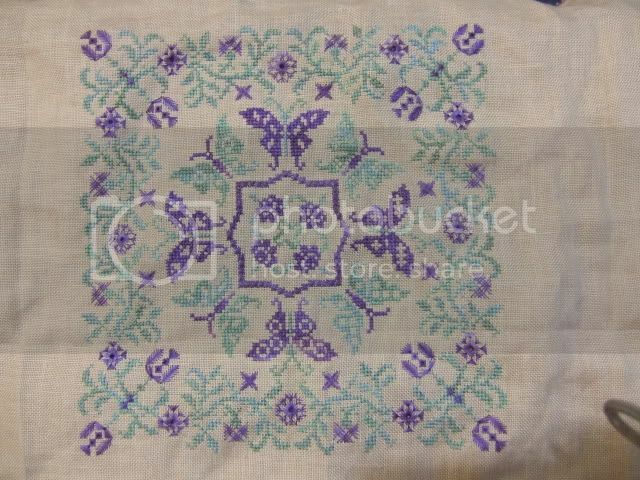 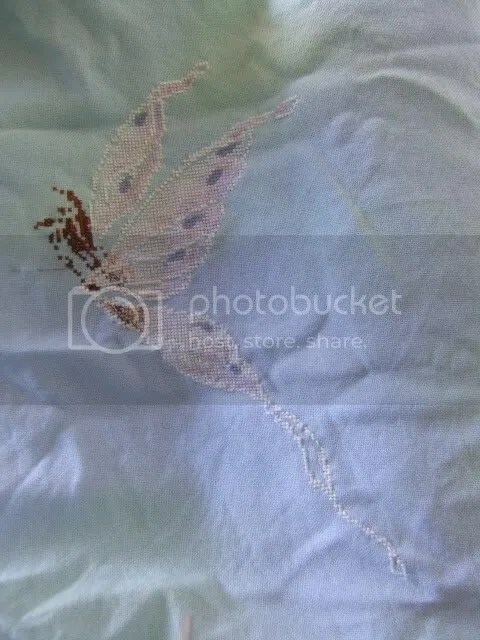 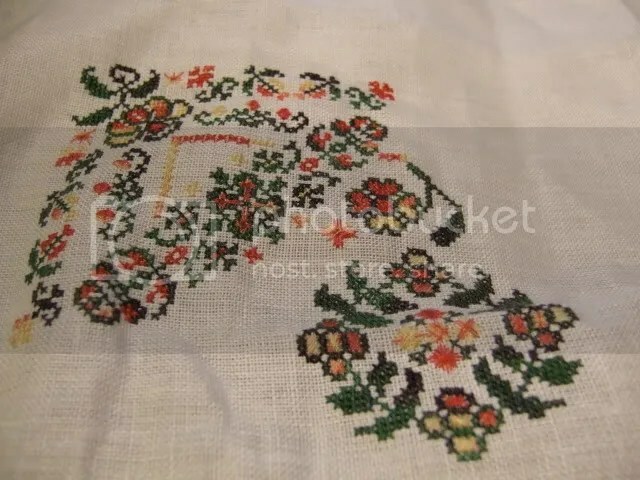 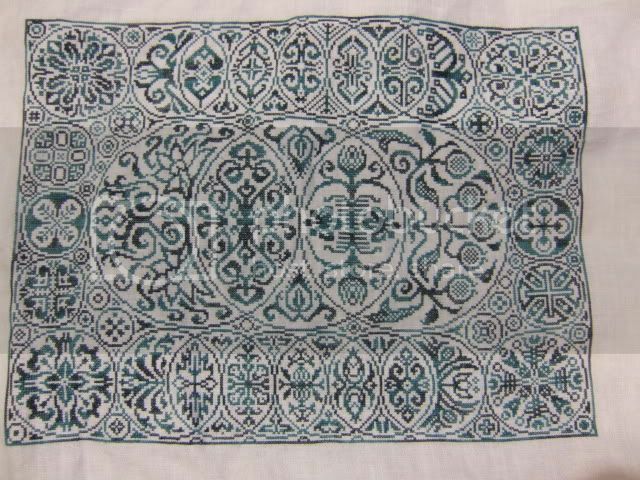 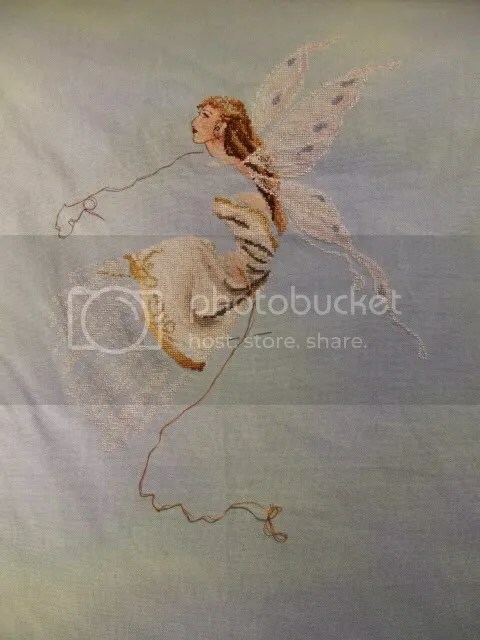 Now I had a question about Chatelaine Misty Morning Vineyard – I am stitching it on white linen – but it is a French linen, so finer than Zweigert and more a creamy white than a bright white. 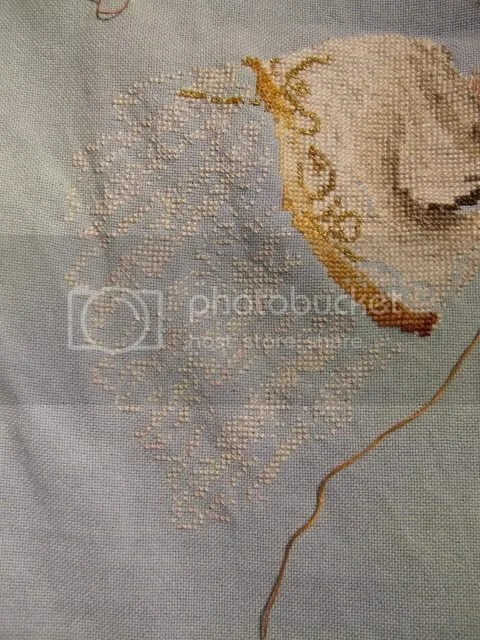 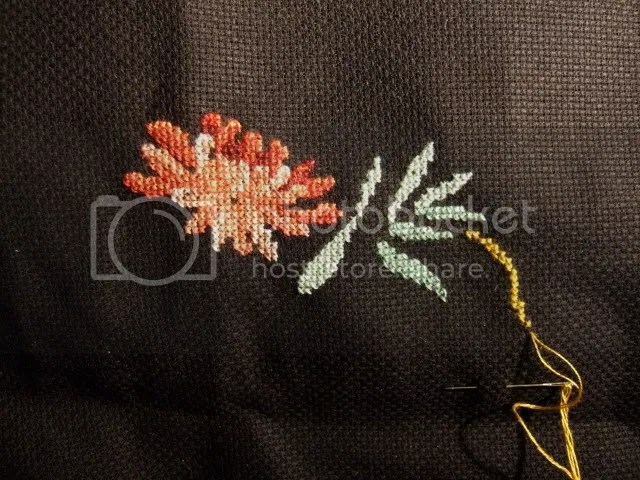 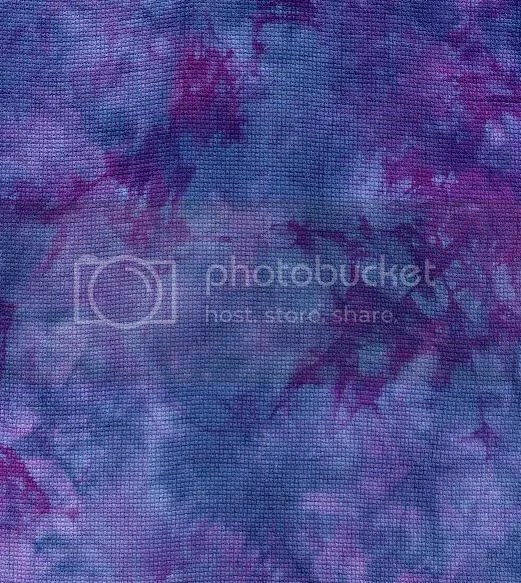 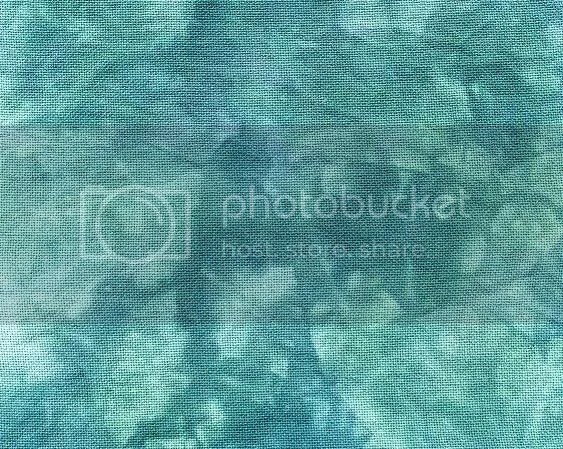 I have converted 90% off it into HDF silks, which I like to stitch with, and am contemplating changing the silk in the border I am currently stitching for a different colour that is closer to the Caron waterlily colour called for… however, I am not sure that I will. 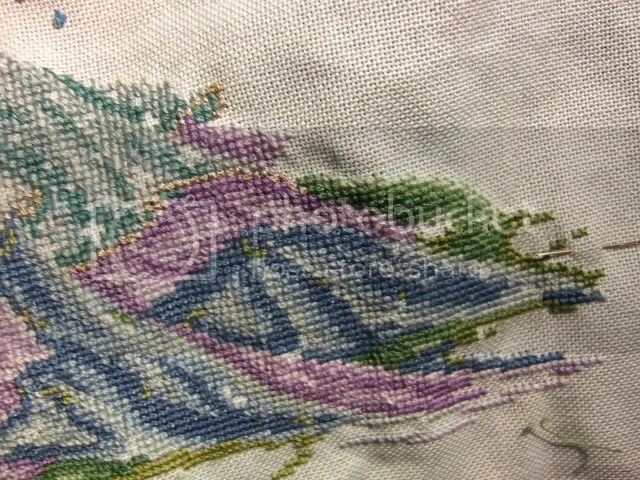 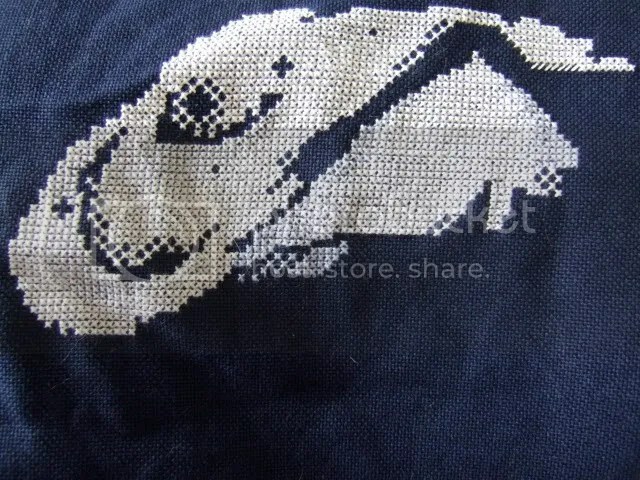 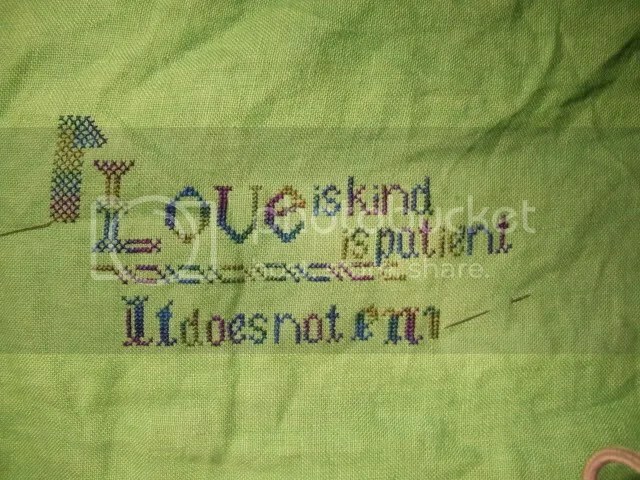 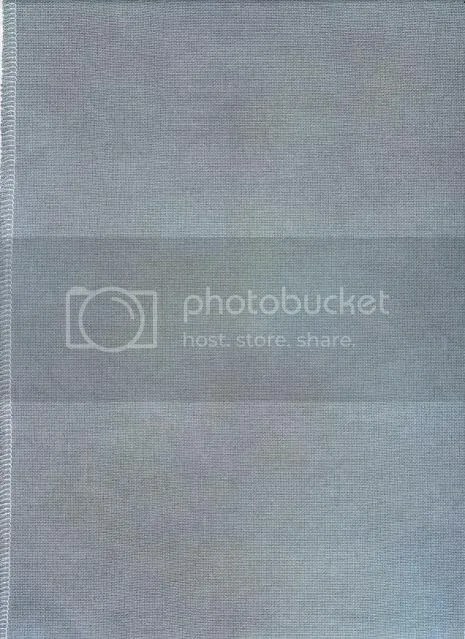 It will look fine with either, but the darker colour varigate is probably closer to the original than the one I am stitching with currently. 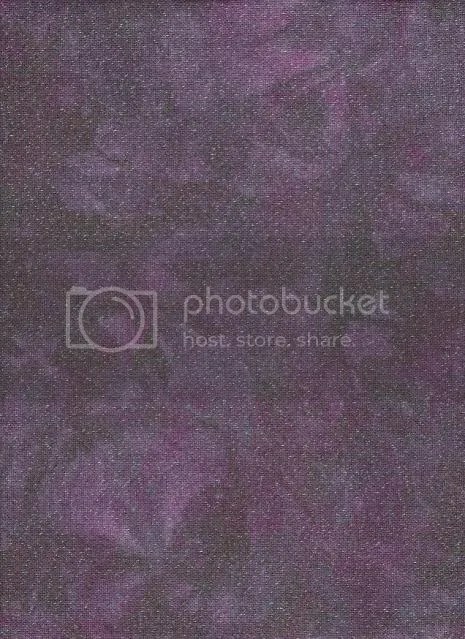 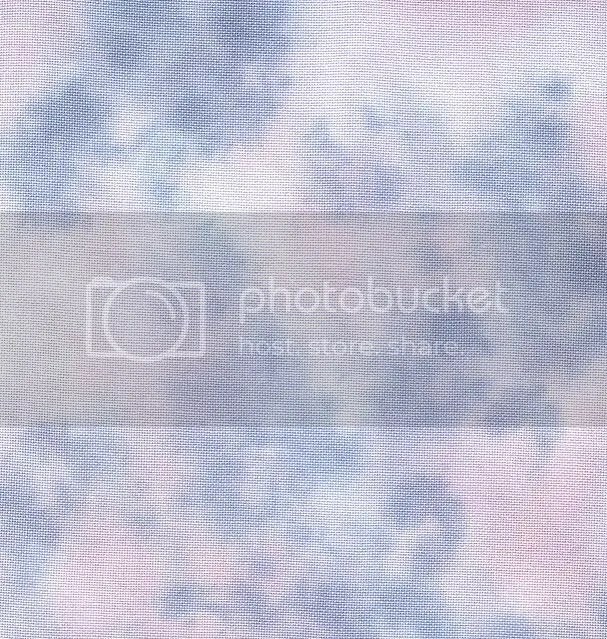 Anyway, if anyone wants the conversion, I can post it. 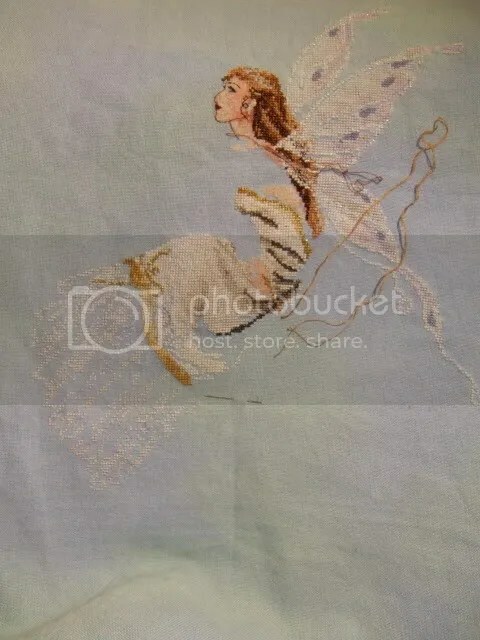 HDF is a lot cheaper than Caron silks. 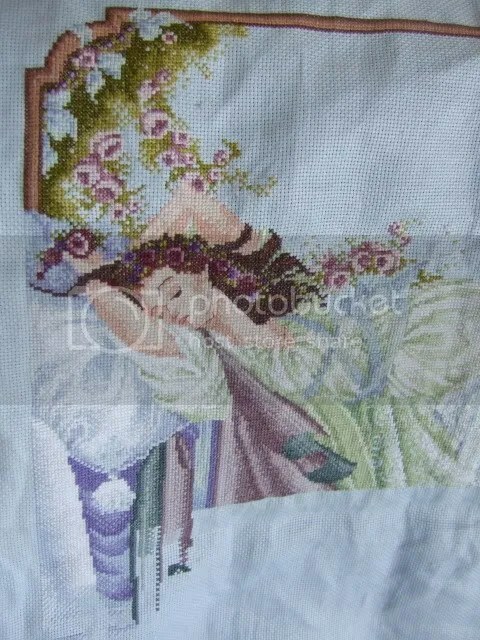 Thanks everyone for all your comments!! 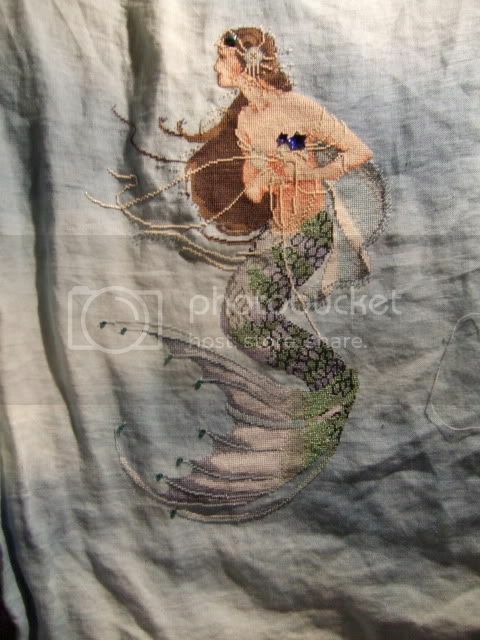 Slowly getting her skirt done. 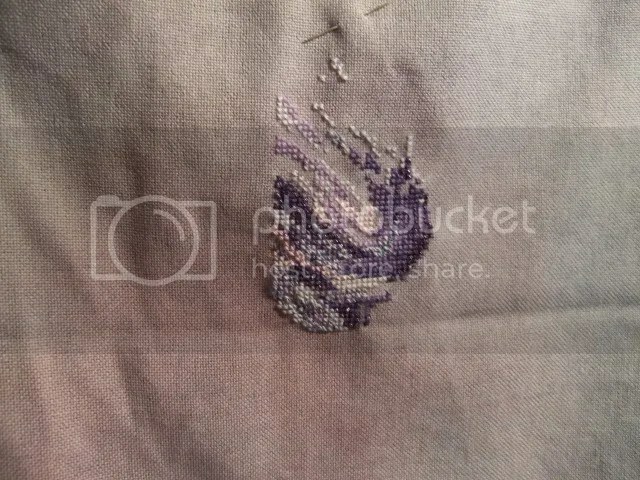 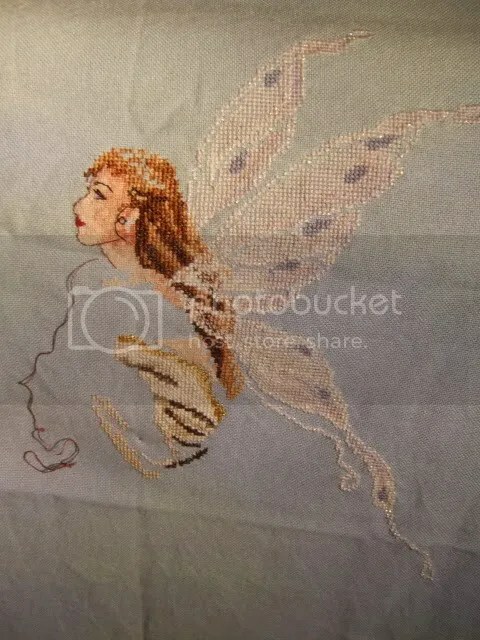 With the over 1 skin… I have made a deal with myself that I will stitch one strand of skin and then can do some of her dress each time I stitch Fairy Queen, otherwise I will never get her done I think. 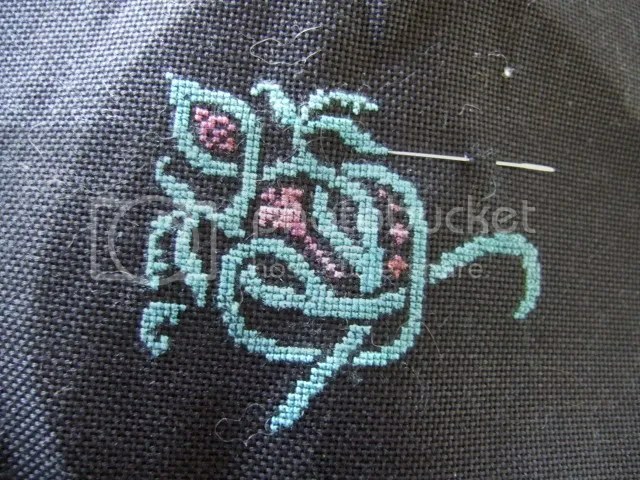 I have done about 50 stitches on my Bramble and the Rose – 25ct 1 over 1 with HDF Bewrayed and bewined. 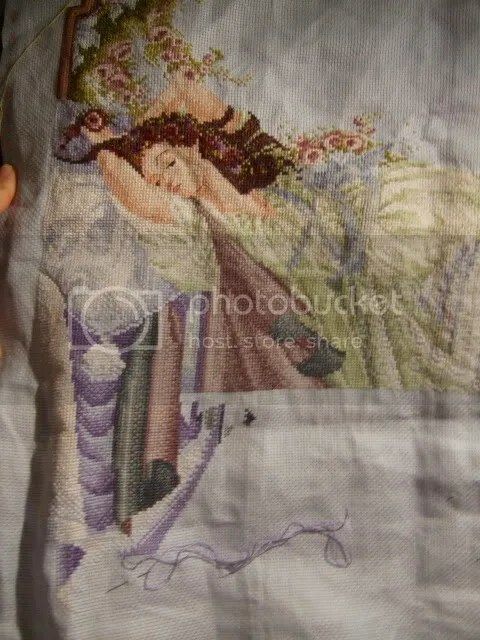 A little bit more on my winter queen – I am going to be so SICK of white by the time I am done I think!!! 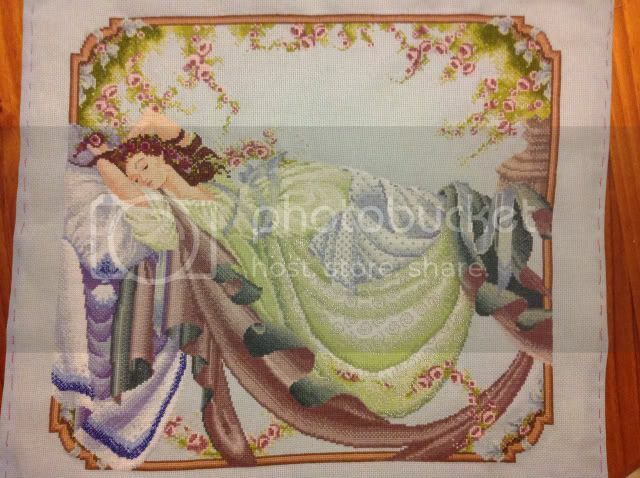 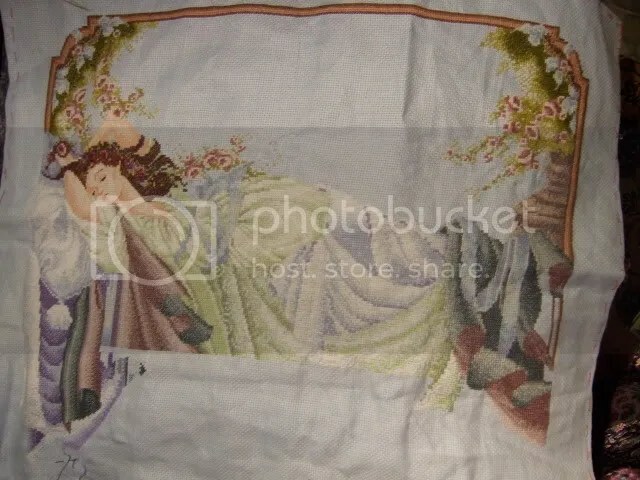 And another 500 stitches or so on Sleeping Beauty. 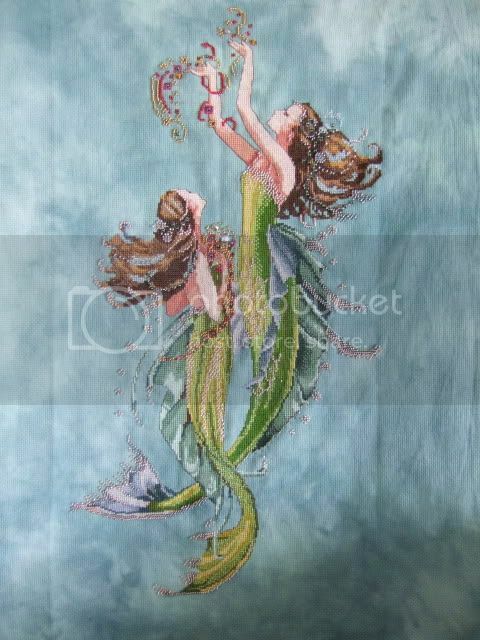 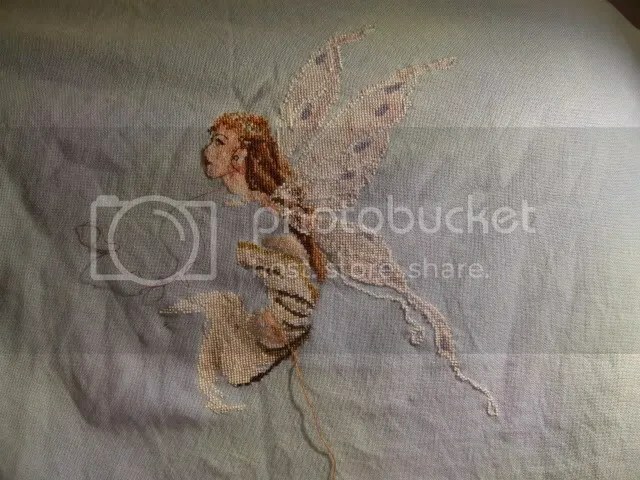 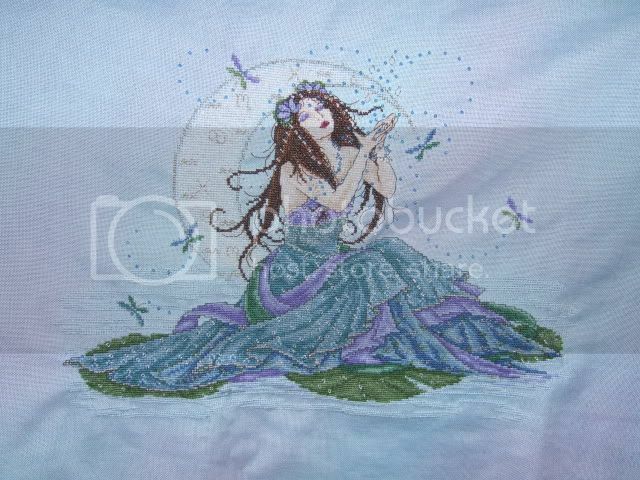 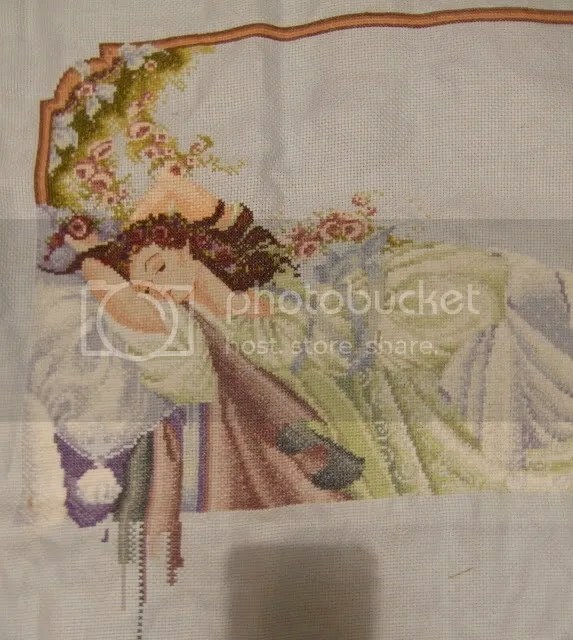 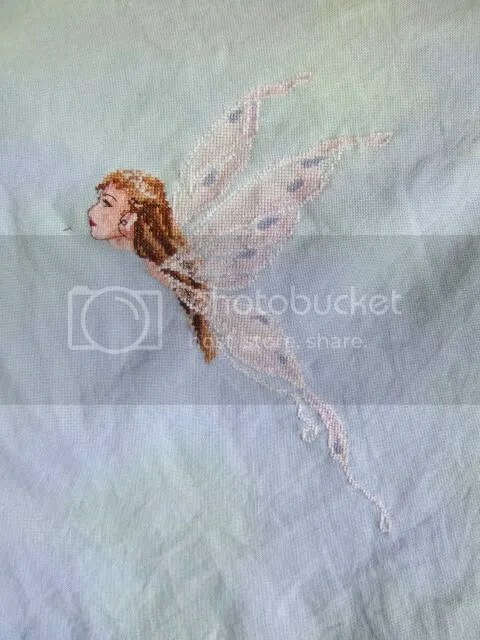 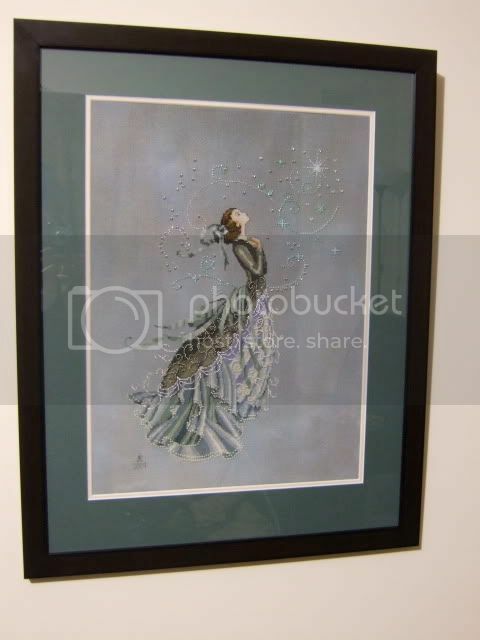 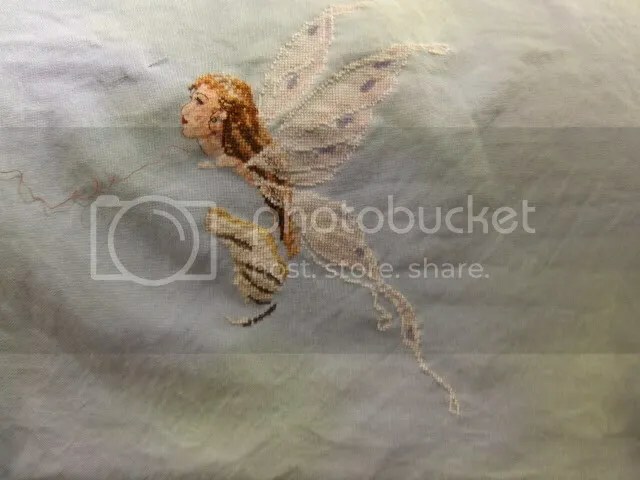 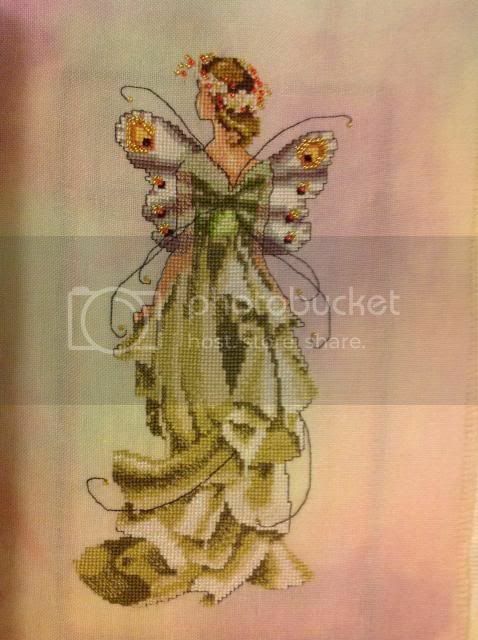 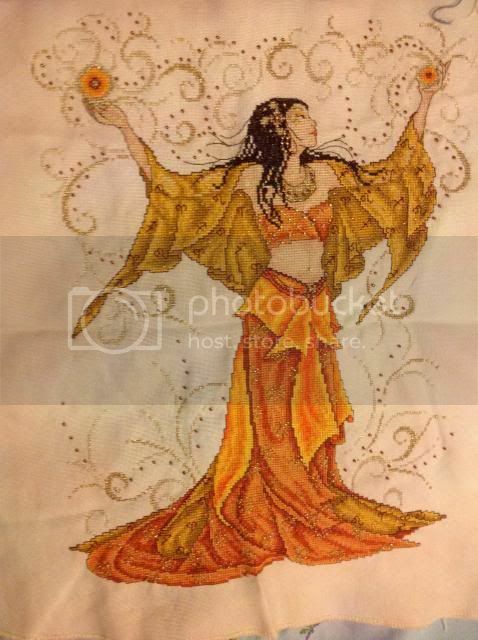 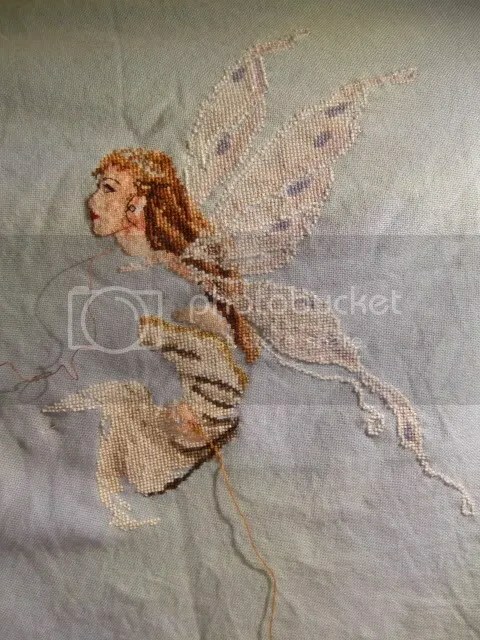 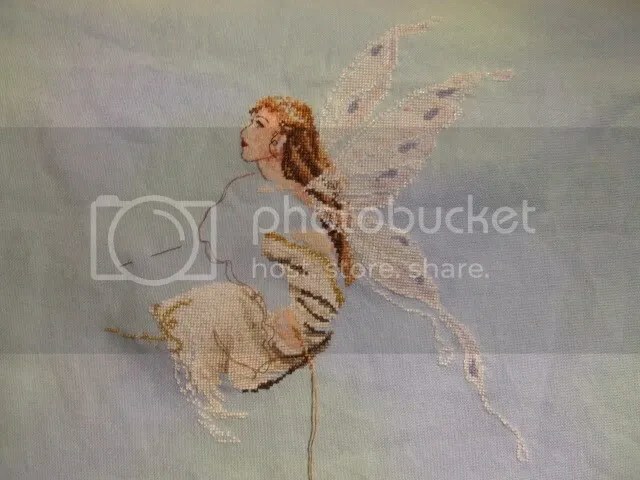 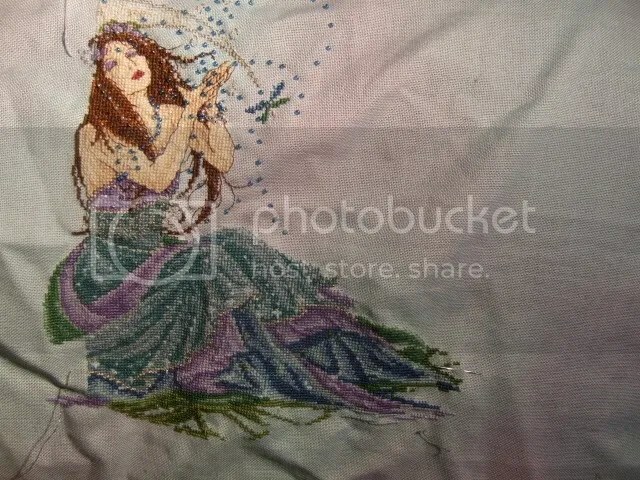 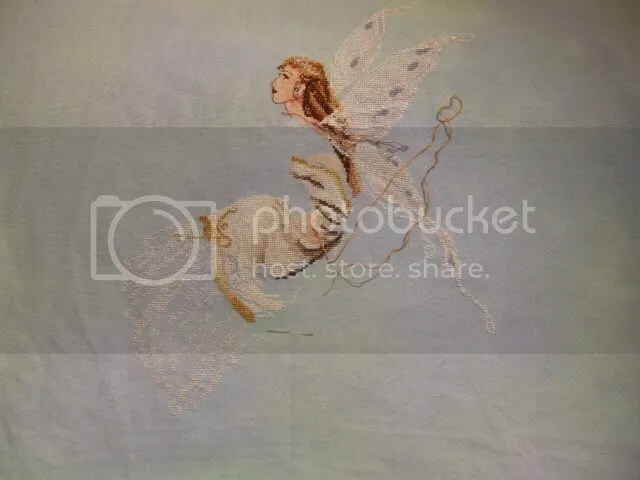 Also I have been picking this up on and off since last tme I stitched her – Fairy Queen – sorry about the shadows. 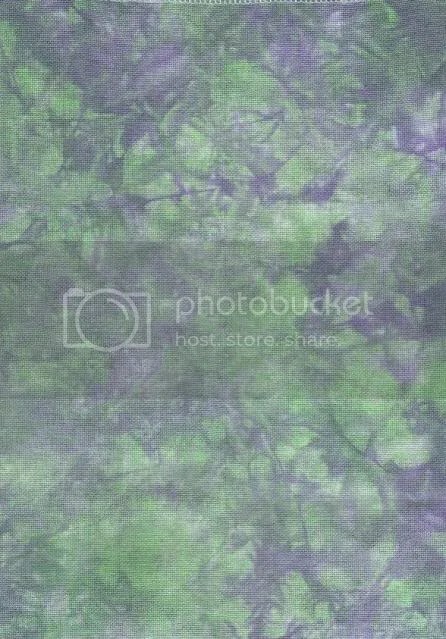 HDF Fire Dragon and a custom green.